This sound like there seems to be a communication gap between the young and the old and distress between what is available for communities to function to sound the alarm. It is clear that information or lack of information is allowing community members to lose hope and only avenue left to them is to close themselves off from help. Aside from not being able to read your article it seems that there is a need for a national state of emergency slated for communities effected and also surrounding communities that might need preventive measures. In my experience with this type of case when a community struggles with suicide epidemics of this magnitude there needs to be linkages form between the care givers and professional who deal with preventive action towards galvanizing choices. If for example there is an Economic disparity or a loss of a major economic source that has been suddenly stopped than this would be the cause of the destabilizing effect and what would be needed would be an alternative economic base. If for example if this is cause by historical destabilization of communities role as care giver than what would be needed would be a shared increase in management role in community infrastructure and key roles in developing action plans for all age groups who require different needs. I don’t no if this would shed light on this area but what I do no is Suicide is a “Cry for help” and realizing the symthms associated to them can cause a red light and preventive measures put in place to root out disfunction. Ending life early is a disfunction caused by lack of cultural understanding of the natural life cycle of an individual within the insights of most indigenous peoples knowledge base. 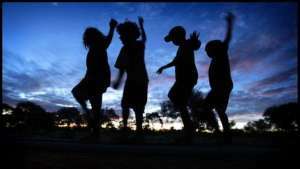 This connection to the self within culture is one that requires the whole community to take action and often is found in the games, songs, arts or story telling embedded within culture in most indigenous cultures. Hope this helps. Here is an example of what we do as a Theatre Company as we visit Indigenous Communities who often lost valuable links to the Elder’s Voice as tools once prevalent in First Peoples Communities. Enjoy. We share our Voice within a contemporary setting mainly because our audience are accustomed to television and we often mix comedy to allow laugher to become the medium when we touch area’s like suicide for example. It provides a positive space in which seriousness often over shadows discussions that often are to hard to bare but often care givers require professional staff at hand. We found that opening area’s of seriousness requires that a readily available staff be notified before hand to handle the influx of calls. Society in General has to be on board to begin making the necessary arrangements to provide the necessary questions asked because better not open pan dora’s box if your able to provide the answers. You can enlist Artist in your area to begin work shopping issue needing addressed and yes you need dollars to pay them well for some time… Hope this helps. Reblogged this on HPCH Practitioner.